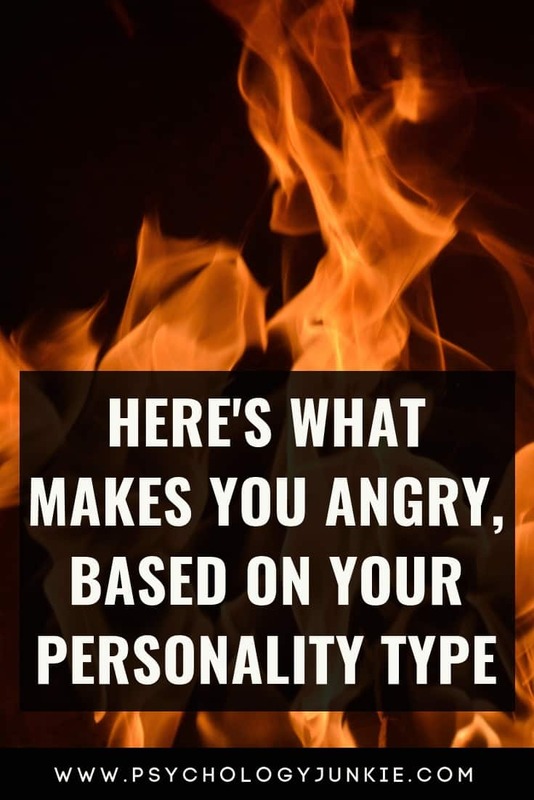 Anger is something that all personality types will experience at one point or another. Some people hold it in until they’ve built up so much frustration that the tiniest thing seems to set them off. Others put their rage on display as soon as they feel it. Still others hold it in till they can physically fight it off through exercise or action. There are probably close to a thousand nuanced ways that we all find to deal with anger. 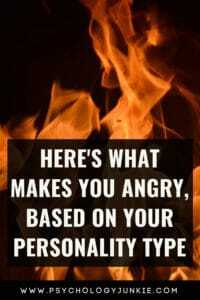 But what is it that makes us angry in the first place? Once again, it’s not the same for everyone. However, it may be similar for people with the same personality type. To be able to understand what it is that’s making someone angry it can help to understand their mental wiring. Extroverts – Feel angry when their need for outer-world stimulation and experience is stifled. This can mean not spending time with people, but it can also mean not working on a project or getting enough real-world experience and variety. Introverts – Feel angry when their need for alone time is dismissed. Time to reflect, analyze, and simmer over experiences is important for the sake of their energy and well-being. Intuitives – Feel angry when their need to brainstorm, innovate, and envision is repressed. They want to imagine future possibilities and think outside the bounds of tradition. They dislike doing things “by the book” or having to focus on nitty-gritty details. Sensors – Feel angry when their time is filled with fanciful ideas that have no place in the real world. They enjoy brainstorming and extrapolating on occasion, but sooner or later they feel the urgent need to DO something and focus on what’s real and tangible. Thinkers – Feel angry when their logical advice is misunderstood or ignored. Dealing with people who use wavering emotions as a basis for decisions is maddening to them. They also dislike passive-aggressiveness or emotional manipulation. Feelers – Feel angry when their values are violated in some way or when people refuse to empathize with others. They feel that so many problems could be solved if people would just try to “get in each other’s shoes” instead of making quick judgments. Judgers – Feel angry when their need for closure and order is ignored or disrespected. They want to know what’s going to happen and when. They don’t like unexpected interruptions and wishy-washy decision-makers. Perceivers – Feel angry when their need for freedom and exploration is de-valued or disregarded. They want to keep their options open and take in as much information as possible before deciding. They dislike being rushed into a decision or forced to conform to a rigid schedule. ENFPs are the imaginative, outside-the-box visionaries you want on hand when you’re exploring an unusual idea or embarking on a pursuit everyone else deems “impossible”. They love thinking outside the bounds of tradition and are more than happy to unpack a possibility with you. Because they are so focused on innovation and potential they become irate when they are limited, constrained, or forced to do things the traditional way. People who are condescending about their creative ideas or dismiss their innovative approaches are exasperating to them. ENTPs are the ingenious and creative thinkers we all wish we could be when we need an inventive way out of a problem. They love to find new ways to do everything, and nothing bores them more than repetition and routine. Enthusiastic and logical, they have a knack for finding unusual solutions to problems that have been stumping more traditionally-minded people for ages. In fact, they have more ideas in a day than most people likely have in a month. While these are great qualities, finding a career and even a lifestyle that can support their outpouring of ideas can be difficult. To be relegated to using a checklist or forced to constantly do things “by the book” will eventually work them into an outrage. And when they’re angry, they can create a plethora of devious ways to express it. Sooooo yeah, watch your back. INFPs are the imaginative dreamers we all need in the world to keep people from losing their sense of wonder. Gentle and serene to the casual observer, they can suddenly become harsh and withdrawn if one of their values is violated or attacked. If they feel like someone is encroaching on their identity or the freedom of someone else they will become uncharacteristically angered and will feel the need to right the wrong and ensure it never happens again. This can come as a surprise to individuals who have seen only the understanding, benevolent version of the INFP until this point. INTPs have a voracious appetite for new information and ideas. Whether they’re signing up for a class, watching a documentary on Netflix, or perusing their local library for inspiration, they constantly need more data. When their need for mental activity is suffocated by meaningless social activities or useless small talk they become restless and agitated. The longer they feel smothered the more they will push back against the barriers they feel are stifling their imagination and thoughts. This can cause them to seem stubborn, conflictive and even difficult to deal with, but all they really want is some time and space to process the fascinating world of knowledge that’s available to them. ENFJs are the insightful, socially affirming leaders that help us to feel validated in our pursuits. They live to solve problems, especially ones that have individuals at odds with each other. Their great desire in life is to make humanity the best version of itself. Because of their awareness of human potential they are often angered by people who continually complain about their problems but refuse to take any advice or steps to change. It quite literally pains them to see people being stagnant and bemoaning their life when they have the potential to overcome and succeed. ENTJs are the confident, decisive, ambitious leaders we all hope to be when we finally get the big promotion we’ve been waiting for. They believe in vision, hard work, and determination. They believe that anything can be achieved and that there’s no use complaining about set-backs if you’re physically capable and have a working brain. When someone is lazy or procrastinates and then blames their lack of progress on “The Man/Family/The System” their annoyance is palpable. People who refuse to take responsibility for their own situations are the bane of the ENTJs life. INFJs are the insightful, harmony-seeking negotiators we all hope are on the job when there is a hostage situation. They naturally notice undercurrents of meaning and the background processes behind people’s decisions and feelings. Because of this tendency they are often called upon when a conflict situation needs to dissolved or someone wants to “vent”. While INFJs often enjoy counseling their friends, they simultaneously need a lot of focused, quiet time to delve into their thoughts. The need for silence can be difficult for them to attain in a world full of gadgets designed to infiltrate their every waking moment. When an INFJ can finally carve out some peaceful time to themselves, any interruption, no matter how small or necessary, can often result in repressed anger and frustration. INTJs are the independent, big-picture perfectionists every entrepreneur wants to have on their team when trying to reach a long-term goal. These types can see how to improve almost anything and have the drive and determination to get it done. They may seem aloof, but that’s just because they’d rather be making strategic plans or solving complex problems than chit-chatting about most day-to-day subjects. Because these types are so thorough in their assessments and so sure of their vision they hate being stifled or forced to work with poorly-conceived plans. If they have to submit to incompetent, distracted leaders they will feel like the walls are closing in around them. In their frustration and anger they may attempt to show people the errors of their ways, but this is often misconstrued as arrogance which only makes them more irritated. ESFPs are the adventure-seeking, outgoing friends we all want to have with us when we go on vacation. If anyone knows how to “seize the day” it would be these types. Vivacious and ready for anything, they flow through life making the best of every situation. However, if you try to reign them in and force them into a schedule without the flexibility of side excursions, they will feel trapped and possibly start resenting you for your lack of consideration. If this happens for long enough their inner indignation, which is often repressed by the delight they find in life, will grow from embers to a full-fledged forest fire. This will leave all to wonder what happened to the fun-loving friend they all had just a moment before. ESTPs are the quick-witted, physically adventurous tacticians we all hope we will be when the zombie apocalypse descends upon us. They know how to react quickly and efficiently to emergency situations and usually have a physical prowess that would make Batman envious. But ESTPs want to have complete control over when and how to use their unique skills. Put them in a cubicle or a repetitious job and you will see them slowly wilt and fade away like that plant in the corner you constantly forget to water. Micro-manage them for no real purpose and Mt. Vesuvius will look like a backyard BBQ in comparison to the fury they unleash. In the end, they probably have a good idea and will skillfully apply it to the situation if you just give them the freedom to do so. ISFPs are the OG’s of authenticity. Reflective and creative, they are on a lifelong search for personal identification and meaning. They process everything based on how it relates to their inner beliefs, emotions, and values. While they don’t like to impose themselves on others, they have no problem putting someone in their place for trying to push them into an agenda they don’t agree with. Probably nothing will make a typically calm and reserved ISFP fly off the handle faster than being forced into a situation where they are manipulated into acting against who they really are. ISTPs are the calm, resourceful pragmatists who seem ready to handle anything – especially on their own. They are who we all wish we could be when our town gets invaded by gangs, terrorists, the mob and especially aliens (I hate it when this happens). Because of their natural ability to react well to crisis situations, if someone prevents them from being able to act as they see fit they will start to get annoyed. If their plan of action is constantly interrupted, they will become outraged. Most likely they will just try to cut ties with the insolent offender and continue to avoid them at all costs without explaining their action. ESFJs are protective and nurturing individuals who rarely get the appreciation they deserve. They go through life very aware of what people need and how to effectively meet those needs. Constantly on the lookout for people who require help, they are known to burn themselves out by putting others first. Inconsiderate drivers, people who “ghost”, negligent parents (or pet owners), these are all the individuals who make ESFJs blood boil. If you want to earn respect from an ESFJ then it’s essential to take responsibility for your life and the people you impact. ESTJs are the list-completing, work before play, no-nonsense people you always dream to be when you have to clean your house. They value order in the world around them and don’t mind working hard to accomplish that order. So when someone violates those values by procrastinating, being late, or shirking responsibility all together there is an indignation that is sparked that can’t be extinguished until they can once again get their outer world organized. ISFJs are the devoted, caring, and dependable individuals we all hope to have on our side once our kids decide to relegate us to a nursing home. They feel duty-bound to take care of everyone around them, especially family members. There is no greater threat to their value system than someone who intentionally hurts the people they care about through neglect, bullying, or manipulation. The idea of preying on someone, abusing power, or simply being selfish and ignorant of people’s needs is anathema to ISFJs. ISTJs are the logical, consistent, responsible individuals that we are all told we should be when we grow up. They have a knack for taking past lessons and applying them to the current situation to improve it. Observant and reserved, ISTJs tend to listen more than talk. When they do speak up, everyone should listen because this means that they have likely amassed a lot of information or experience related to the subject at hand. If their input is ignored, it can feel to them like their experiences are being attacked. When this happens they may take leave of the group, but don’t be deceived. Their exit isn’t related to fear but anger for having their ideas dismissed so quickly. They are going to find somewhere else their ideas and inputs are valued and appreciated. Did you enjoy this article? Let us know your thoughts and insights in the comments! This article is very helpful! Now I understand why I enraged 2 ESFJs (“ghosted” them, then suddenly reappeared 2 years later as if nothing happened), an ISTJ (took my assistance and good ideas to a “competing” group because he refused to listen to them or let me help), an ISTP (told him to wait on an action item when he wanted to quickly proceed), an INTJ (suggested that I become her project assistant), and an INTP (kept barging into her private space to vent about my relationship and work problems that she doesn’t care about, then vent about the fact that it’s obvious that she doesn’t care 😂). I returned to the “social group” that the ESFJs “manage”. They are nice to me but still act paranoid about the possibility of me suddenly leaving again, bring up my last exit as if it’s an unforgivable sin, and ask for my contact information almost every time I see them. I don’t make any plans with them. I consistently show up and help the ISTJ without notice. I make baby-step progress in the direction that the ISTP wanted to go in with me without hindering his actions. I unofficially assist the INTJ. I “just happen” to be around for her to ask me a question, which solves a strategic/implementation problem.